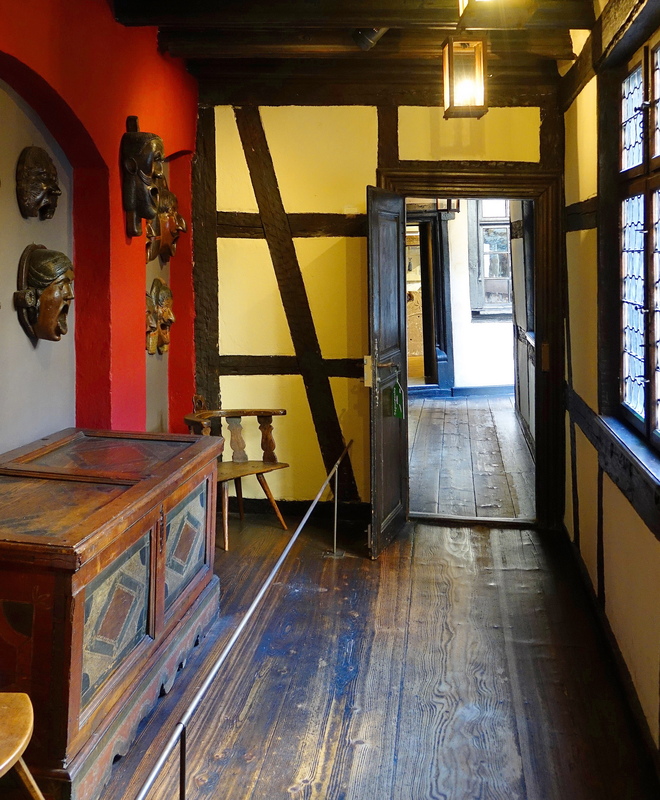 The Alsatian Museum in Strasbourg France is located in three adjoining homes built in the 1600’s. 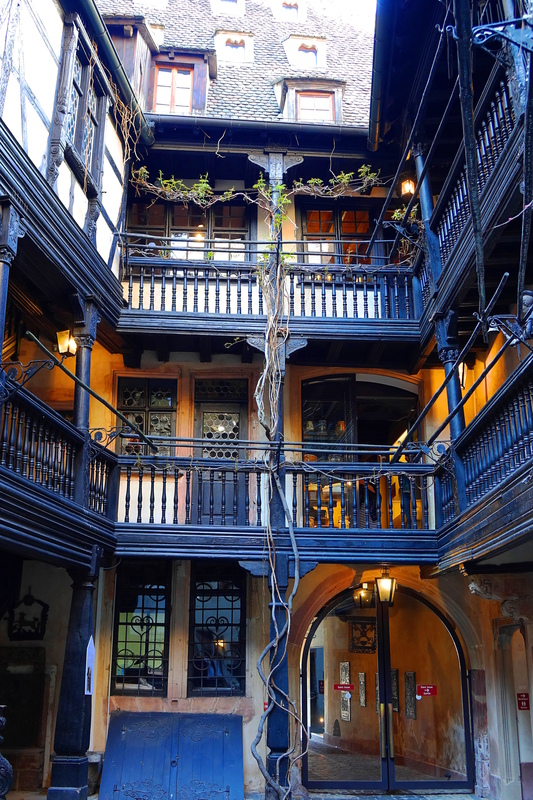 All the homes have inner courtyards with multi-storied covered walkways. We stayed in the Hotel Corbeau nearby that was similar in style and built in 1528. 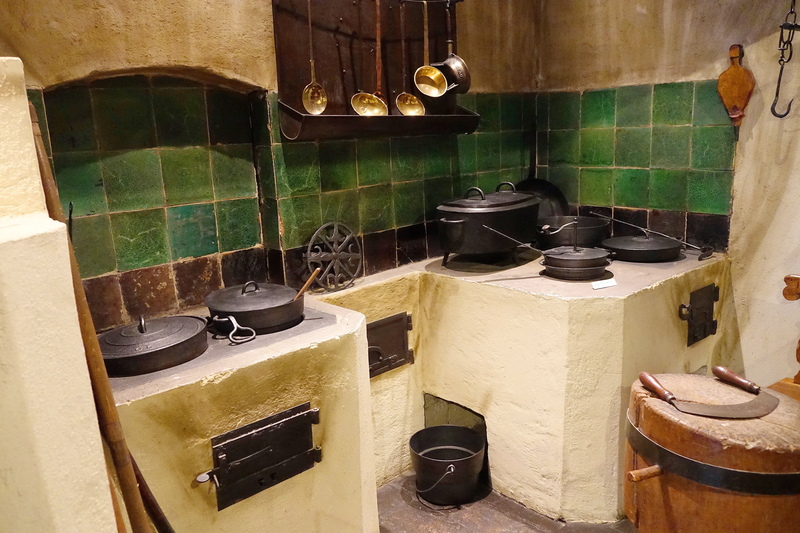 The museum homes are filled with over 5000 artifacts depicting everyday life. 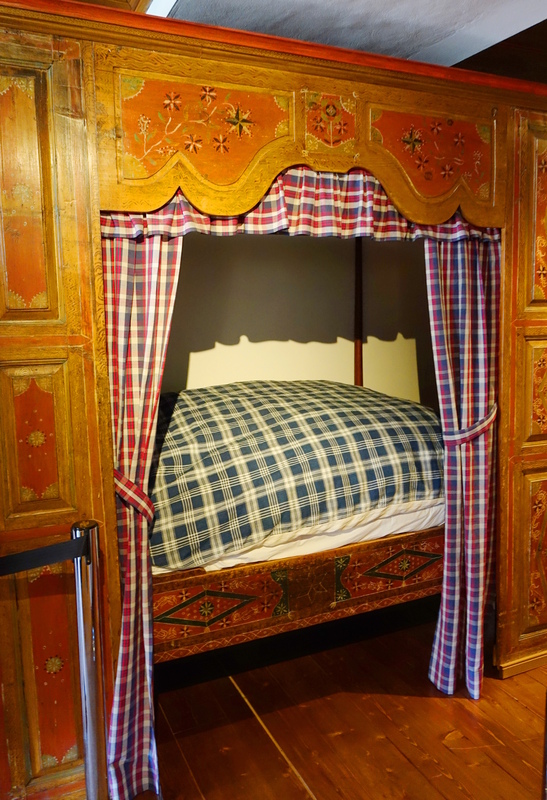 Hand carved and painted woodwork is especially charming as you see in this very cozy bed. Flour mill spouts attest to the emphasis placed on artistry in everyday living. Many homes of this era contained family businesses like this old pharmacy. 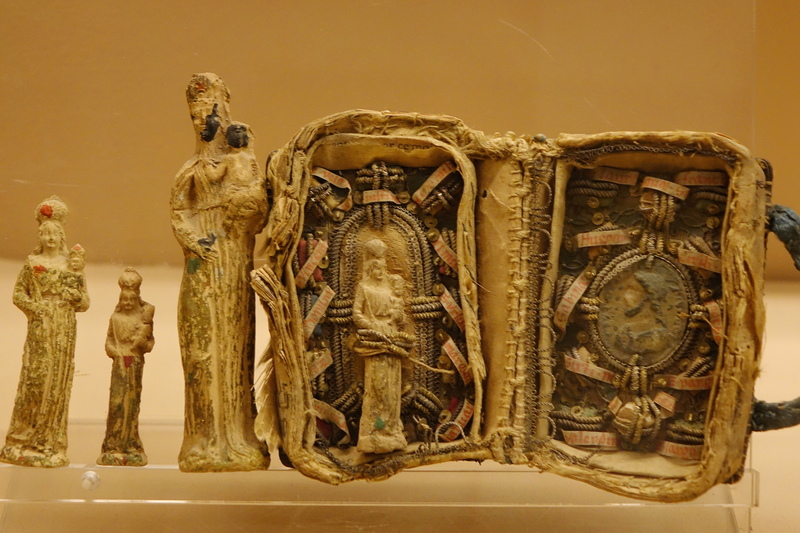 This typical traveling prayer case demonstrates both faithful devotion and an artistic sensibility. Hilarious…….laughing! This is also why we are lucky we don’t walk around with mirrors in front of faces. We might look like this too! Hugs back to you & thank you too! Cindy’s photographs are stunning and beautiful! Thank you Tanveer for such a beautiful comment & cheers to you! Absolute treasures, Cindy! The bed reminded me of a bed my paternal grandmother used to have. I love sleeping in it on my visits. Wow! What is there not to like, here? Well people who go for glitz and gold leaf wouldn’t like it, which is fine by me as I don’t like glitz! Beautiful Cindy, thanks for sharing! I’ve never before seen so many stunning details put into objects used for everyday life. Absolutely remarkable. I think we have lost a lot of that artisan attention to detail and the impulse to create beauty in everyday objects which is sad for us. I wonder if that has something to do with the disposable nature of everyday objects? Yes. We mass produce everything so much of which is made of plastic and then we throw it all in the ocean. This is called technological progress. Wow, a hotel from 1528? Great virtual tour Cindy. So happy you enjoyed it. We stayed in a rampart of a castle on the same trip that was built in the 1200’s! I should post photos of the place. It was pretty amazing! Sounds like fun and can’t wait to see your photos! Wondrous! I experienced these scenes as a mini getaway! Looking forward to the real thing some day! In the meantime, I adore these images and am so grateful for that craftsmanship and woodwork! The challenge of missing other eras and their inspirations… while living in these contemporary times. Thank you for such a thoughtful and lovely comment! I love looking at photos of interior spaces too. It is a vacation for the mind and psyche, so pleased you enjoyed & cheers to you! 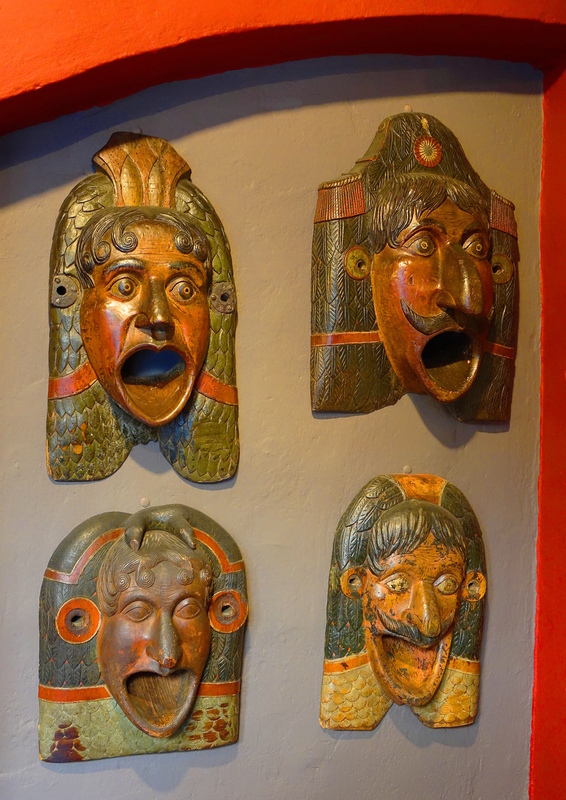 More splendid travel photos from Cindy Knoke. Your photos really makes me want to go there! Lovely, gorgeous and so special!! I am treasuring seeing a wide variety of French and Bayou items in flea markets and other locations in both Louisiana and Mississippi. Hugs from Long Beach and love your positive views on LIFE! 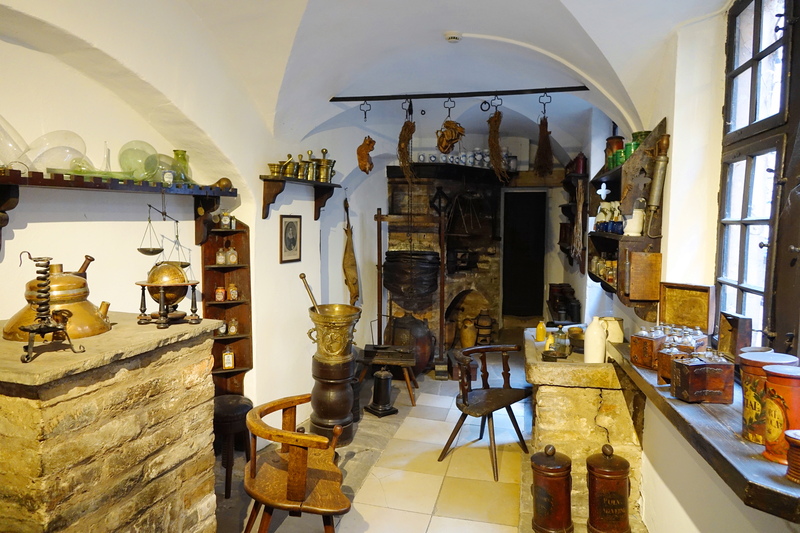 Breathtaking work…I adore the old kitchen, the imagination just runs away. Beautiful place. The top photo reminds me of my childhood home. Yes, Cindy, the rail was iron and the wall were white, but the setting was the same with so many plants on each level. It was so romantic. si c’est en france, mais oui j’ai confiance – the original french way of living. merci Cindy! bon dimanche a toi! 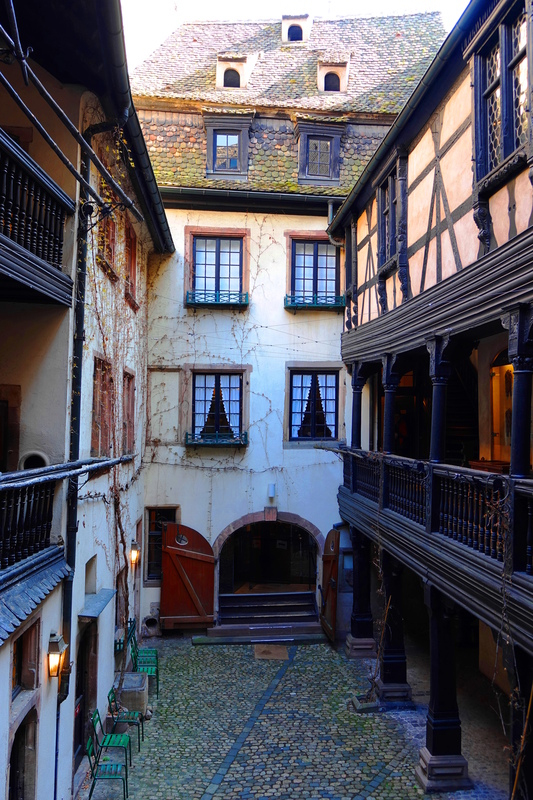 The deal with Alsace is that it has moved back and forth in recent history under German and French control, and it is this wonderful combination of both. You can taste it in the food, and see it in the architecture, art and artifacts. It is a really interesting place in that it is a cultural mix. So it could be entirely true, he was French, and German. All the most interesting places, and people, are such a gimmish, and I suspect you and I might be too. Maybe it’s a Little America. I like fusion cooking, and people who understand many cultures. It’s fun. Yay! I like your spark! Thanks much & cheers to you!